Many of us are interested in the world of stocks and always looking to learn more. Whether you’re a day trader, short seller, investing for retirement, or interested in getting started in the world of investing, we’re all looking for resources that will help us learn more about investing and become a more educated investor. First off, the all-important question: why invest in stocks? There are a variety of investment options, including real estate, mutual funds, ETFs, etc. Everyone has an opinion, and the truth of the matter is that there are many factors in determining if an investment is right for you. You have to decide what sort of return you’re looking for, how much you’re able to invest, what kind of risk level you’re comfortable with, etc. Stocks have proven their worth through the ages with one of the highest rate of returns over any other investment. At the same time, when you invest in stocks you have to accept a certain level of volatility. There’s no guarantees, and you have to be ready to weather the highs and the lows. With that being said, if you’ve decided to invest in stocks, you’ll want to read through the rest of this article for some valuable tips. Through this article, I’d like to offer some insight on the best stock charting software out there. What is stock charting (also called technical analysis)? By understanding historical price patterns of a stock investors can begin to predict and analyze future patterns. There are basic and advanced levels of stock charting, but all investors should have a basic understanding of stock charting at the very least. Some invest solely off technical analysis, others simply include it as a factor in their investments without hinging everything on them. Now that we know more about stock charting, the importance of having good software to help chart can be realized. In essence, stock charting software makes it easier for an investor to analyze and track potential investments. Below you’ll find a ranking of my five favourite softwares for stock charting with a brief summary of the highlights and drawbacks as well as a screenshot of the basic home page interface. This should give you an insight into the main contenders as well as help you pick the one for you! What’s most likeable about Stockcharts.com is the ease with which you can get started. The home page provides the user with commonly searched stocks, currently top charted stocks, and different market summaries. Most of the features are available for free users, and only some of the features are restricted for paid users (historical charting and more in depth analysis). Stockcharts.com is our #1 choice for it’s immediate usability, simple interface, and wealth of resources. Is there anything Google doesn’t do well? The great thing about Google Finance is that it compiles all the latest news articles and stock analysis pieces from around the web, keeping the user up to date with the latest information. It requires a little more exploration than Stockcharts.com but it has all the essentials for good stock charting software. We like Google Finance for #2 because it has all the basic tools you need to research, track, and pick the stocks that you want to invest in. Yahoo’s financial software is similar to Google’s with some of the best features including a News bulletin that comes across the main page offering the latest Stock to Watch. It displays some of the best and worst tracking stocks of the day, and has all the search functionalities as #1 and #2. Our favourite feature of Yahoo Finance is the Stock to Watch daily bulletin and that raises it to #3 in our books. TradingView has a beautiful interface and community-driven model. You can follow and see annotations from other members, and this information can either be useful or distracting. It also has some advanced features available through paid subscription (similar to Stockcharts.com). We love the visuals of TradingView and the interface is one of the main reasons we rate it at #4. Listed at #5 for the simple reason that it’s not completely free long term. There’s a 30-day free trial initially followed by a paid subscription model. Overall, eSignal has the most thorough charting software of the other contenders and only loses rating based off the price (i.e. it’s not completely free!). 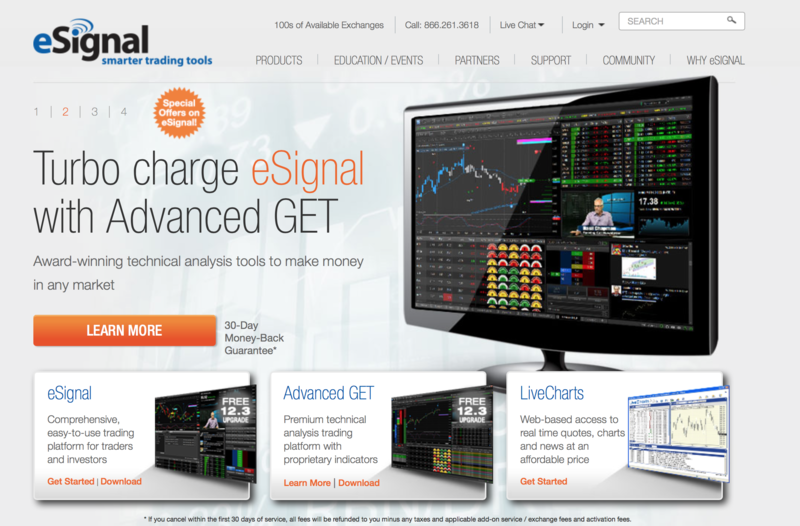 If you’re looking to take the next step in stock charting software than eSignal might be the tool for you. If you’ve completed this article, you are obviously interested in wisely investing for your future. Your investing journey will never end, and you’ll always be interested in learning more. This is but one building block that must be included in your investing strategy, but we encourage you to continue learning more! In summary, stock charting software is essential for any educated investor, and any of these softwares are bound to help you in your stock trading journey. Hopefully upon finishing this article, you’ve found the software for you and are ready to get started! The post The Top 5 Free Stock Charting Softwares appeared first on Blogtrepreneur – For Busy Entrepreneurs.